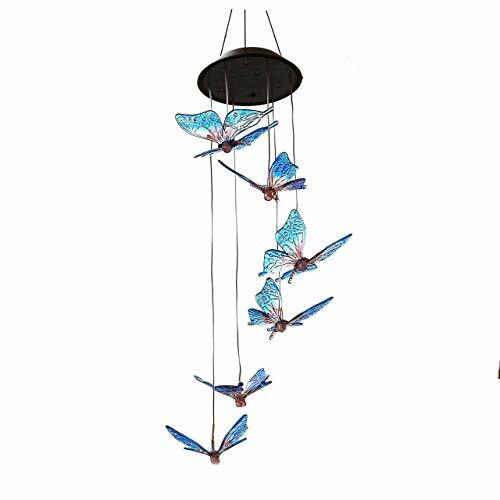 【Indoor Outdoor Décor 】Add unique hanging decoration to your outdoor space with these solar powered wind chime. Ideal for lawn, garden, patio, yard, hall, roof, living room, bed room decoration. 【Longlife WindChime Light】Independent operating LED lights, last up to 8 hours with fully charged during the day. 【LED Hanging Lamp】Energy saving and environment friendly, solar panel automatically recharges during day and automatically turns on lights during night. 【Color-changing Wind Chime】Mini chimes bring delightful sound, featuring a color changing LED bulb illuminating the crystals at night, calmly and softly changing from one color to the next. 【Solar Lighted Mobile】Easy to use wind chimes and convenient to hang on, no wiring or external electricity required for use. If you have any questions about this product by SINLOOG, contact us by completing and submitting the form below. If you are looking for a specif part number, please include it with your message.